58 | Th e M Rep o RT O r i g i nat i O n s e r v i c i n g a na ly t i c s s e c O n da r y m a r k e t SECONDARY MARKET the latest cFPB says marketing services agreements Undermine consumer kickback Protections The bureau has detected marketing services agreements that violate ReSpA and warns the industry against them in a new bulletin. 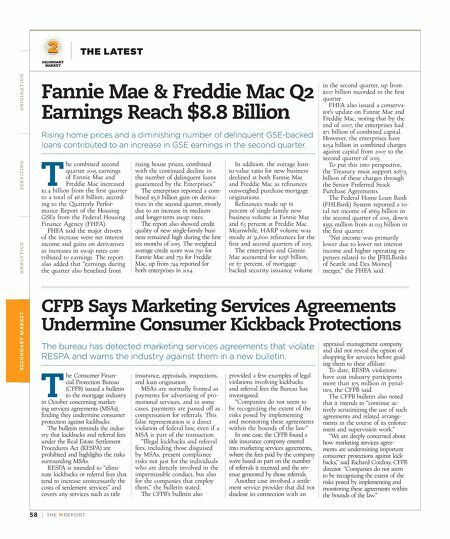 t he Consumer Finan- cial Protection Bureau (CFPB) issued a bulletin to the mortgage industry in October concerning market- ing services agreements (MSAs), finding they undermine consumer protection against kickbacks. The bulletin reminds the indus- try that kickbacks and referral fees under the Real Estate Settlement Procedures Act (RESPA) are prohibited and highlights the risks surrounding MSAs. RESPA is intended to "elimi- nate kickbacks or referral fees that tend to increase unnecessarily the costs of settlement services" and covers any services such as title insurance, appraisals, inspections, and loan origination. MSAs are normally framed as payments for advertising of pro- motional services, and in some cases, payments are passed off as compensation for referrals. This false representation is a direct violation of federal law, even if a MSA is part of the transaction. "Illegal kickbacks and referral fees, including those disguised by MSAs, present compliance risks not just for the individuals who are directly involved in the impermissible conduct, but also for the companies that employ them," the bulletin stated. The CFPB's bulletin also provided a few examples of legal violations involving kickbacks and referral fees the Bureau has investigated. "Companies do not seem to be recognizing the extent of the risks posed by implementing and monitoring these agreements within the bounds of the law." In one case, the CFPB found a title insurance company entered into marketing services agreements, where the fees paid by the company were based in part on the number of referrals it received and the rev- enue generated by those referrals. Another case involved a settle- ment service provider that did not disclose its connection with an appraisal management company and did not reveal the option of shopping for services before guid- ing them to their affiliate. To date, RESPA violations have cost industry participants more than $75 million in penal- ties, the CFPB said. The CFPB bulletin also noted that it intends to "continue ac- tively scrutinizing the use of such agreements and related arrange- ments in the course of its enforce- ment and supervision work." "We are deeply concerned about how marketing services agree- ments are undermining important consumer protections against kick- backs," said Richard Cordray, CFPB director. "Companies do not seem to be recognizing the extent of the risks posed by implementing and monitoring these agreements within the bounds of the law." 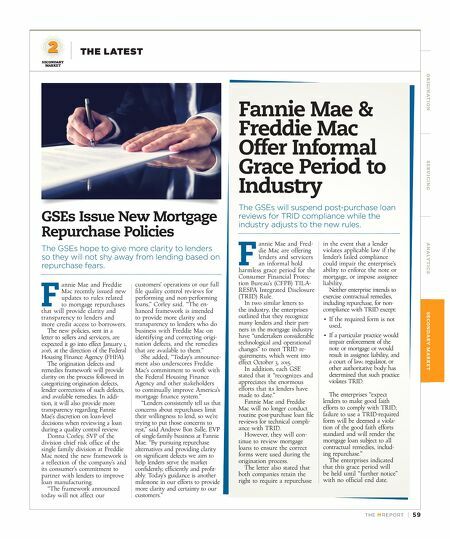 Fannie mae & Freddie mac Q2 earnings reach $8.8 Billion Rising home prices and a diminishing number of delinquent GSe-backed loans contributed to an increase in GSe earnings in the second quarter. t he combined second quarter 2015 earnings of Fannie Mae and Freddie Mac increased $2.4 billion from the first quarter to a total of $8.8 billion, accord- ing to the Quarterly Perfor- mance Report of the Housing GSEs from the Federal Housing Finance Agency (FHFA). FHFA said the major drivers of the increase were net interest income and gains on derivatives as increases in swap rates con- tributed to earnings. The report also added that "earnings during the quarter also benefited from rising house prices, combined with the continued decline in the number of delinquent loans guaranteed by the Enterprises." The enterprises reported a com- bined $5.6 billion gain on deriva- tives in the second quarter, mostly due to an increase in medium- and longer-term swap rates. The report also showed credit quality of new single-family busi- ness remained high during the first six months of 2015. The weighted average credit score was 750 for Fannie Mae and 751 for Freddie Mac, up from 744 reported for both enterprises in 2014. In addition, the average loan- to-value ratio for new business declined at both Fannie Mae and Freddie Mac as refinances outweighed purchase-mortgage originations. Refinances made up 61 percent of single-family new business volume at Fannie Mae and 63 percent at Freddie Mac. Meanwhile, HARP volume was steady at 31,600 refinances for the first and second quarters of 2015. The enterprises and Ginnie Mae accounted for $258 billion, or 67 percent, of mortgage- backed security issuance volume in the second quarter, up from $207 billion recorded in the first quarter. FHFA also issued a conserva- tor's update on Fannie Mae and Freddie Mac, noting that by the end of 2007, the enterprises had $71 billion of combined capital. However, the enterprises have $254 billion in combined charges against capital from 2007 to the second quarter of 2015. To put this into perspective, the Treasury must support $187.5 billion of these charges through the Senior Preferred Stock Purchase Agreements. The Federal Home Loan Bank (FHLBank) System reported a to- tal net income of $669 billion in the second quarter of 2015, down $355 million from $1.023 billion in the first quarter. "Net income was primarily lower due to lower net interest income and higher operating ex- penses related to the [FHLBanks of Seattle and Des Moines] merger," the FHFA said.